Fresh green peppercorns are unriped peppercorns. These are available in market during season. Green peppercorns are popular in French, Thai, and Western European cuisine too. In addition to that, green peppercorns have numerous health benefits. They aid digestion, and helps reduce acidity and many stomach ailments. They also help in fighting bacterial growth in the intestines. Green peppercorns are high in iron, vitamin K, and antioxidants. The skin of the peppercorn is helpful in breaks down fat cells, and help in losing weight. The chemical 'piperine', found in it have anti-cancer properties as well. This is a traditional way of pickling fresh, raw peppercorns. This is an oil-free pickle. This has a good. strong flavour and very easy to make. Buy firm, fresh and tightly stuck to the stem peppercorns. DO NOT separate the peppercorns from the stem while pickling. ENSURE THE PEPPERCORNS ARE FULLY IMMERSED IN THE BRINE SOLUTION. Store in a glass or ceramic jar/bottle. DO NOT keep this in a stainless steel or any metal utensil. Ensure dry spoons while taking out the pickle. The colour changes to black when not fully immersed in lime and salt solution. No worries, it is edible. Wash the peppercorns well and pat dry with a cloth. Allow it to dry completely. Powder the salt in a mixie. Take a dry wide mouthed glass or ceramic bowl. I used a square borosil bowl with lid. Layer the bottom with salt, then place the peppercorns and add turmeric powder and salt . Repeat the process with layers of peppercorns, salt and turmeric powder. Pour the lemon juice . ENSURE THE PEPPERCORNS ARE FULLY IMMERSED IN THE LIME JUICE. This prevents the pickle from blackening. Close with an airtight lid. Mix well daily. Each time when you mix, ensure the peppercorns are immersed in thebrine solution. Within a week, the colour of the peppercorn will turn to a translucent and mild, light green colour. Hot, spicy and brined peppercorn pickle is ready to eat. Tastes best with curd rice. It can be preserved for a year, when refrigerated. 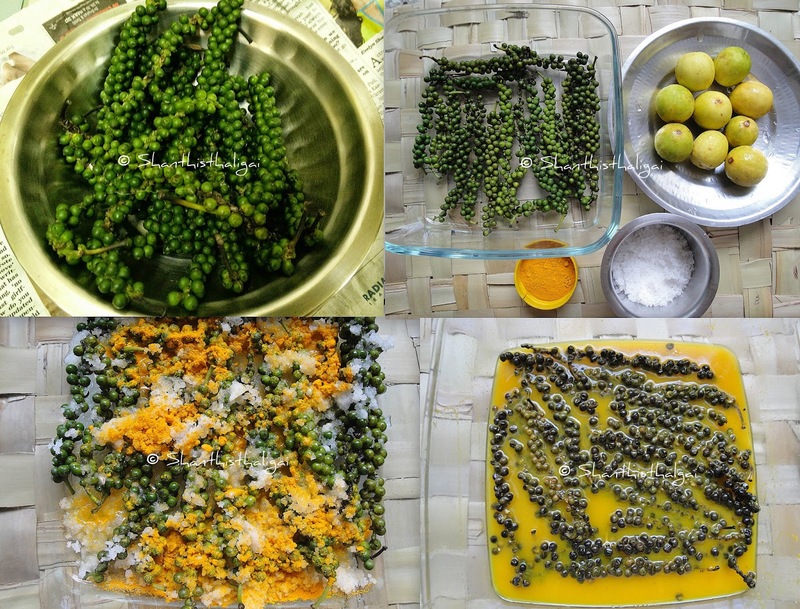 The same solution, if in excess, can be used for the next batch of green peppercorn pickle. The pickle, though ready to eat in 4 or 5 days, tastes awesome day by day. Any place I can buy this in Chennai? where do we can buy green pepper in chennai?